Ice fishing is a method of fishing wherein a fisherman, or angler as they prefer to be called, cuts a hole through the frozen cover of a lake, pond, or even a river at times. Once the hole is dug, the angler would set-up his spot and wait for the fish to catch. Traditionally, ice fishing came from the northern hemisphere where frozen bodies of water are present. It is said that Eskimos have been doing this practice for ages while North American Indians also claim to have started the practice. Both indigenous people may have the right to declare themselves as the pioneers of ice fishing but one thing is for sure, ice fishing was brought about by the need to survive during the harsh winters. It is during this period that wild game hibernates and hides in their burrows while fish and birds migrate to warmer climates leaving humans with little or no source of sustenance. 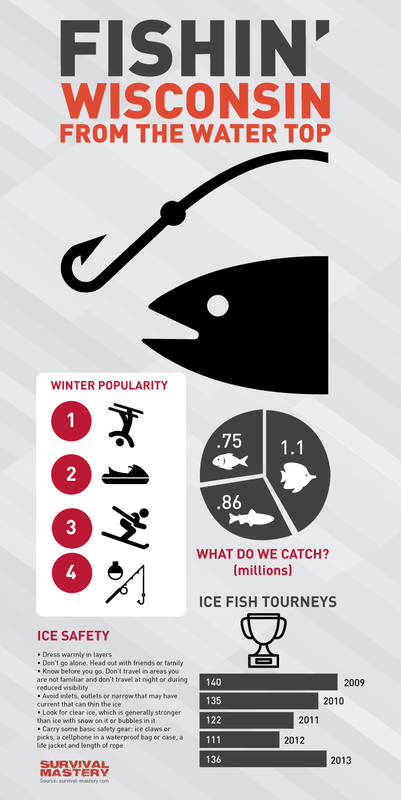 As years go by, ice fishing has evolved from a method of survival to a sport wherein anglers compete on who has the biggest catch. 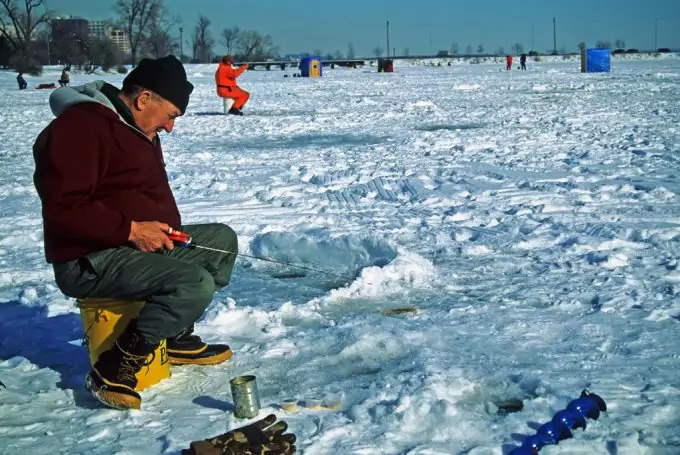 It has even evolved into a social event wherein several people rent an ice shanty or a fish house and gather around an already existing hole to fish, exchange stories, share the occasional liquor and bond while they wait for the fish to bite or for their shuttles to arrive, whichever comes first. Ojibwa Indians and Eskimos have employed spears in the past to chip the ice cover and slowly build a hole in which they could fish in. The same spear that they used to chip the ice is often the same spear that they use to spear the fish. They would often sit on a bucket, stool or a rock and wait until fish approach a decoy that the indigenous tribe has crafted out of wood. Once the fish has taken the bait, the angler would then take the opportunity to spear the fish or take it out of the water using his bare hands. You might be confused as bare hands were used in the last example but this is about fishing. In theory, there are several approaches to traditional ice fishing. You have your traditional fishing line and bait wherein the angler would use rods made of wood as their main fishing rod and strings that were covered in wax so that the fibers would not freeze while the fishing line is immersed in the freezing water. The second traditional approach is the spear which was described earlier in this section. The third approach is called clubbing where, as the name suggests, the fisherman would wait over relatively thinner ice for fish to approach the surface and use a wooden club to smash the ice. The force has to be great enough to apply pressure on the fish and paralyzing it long enough for the angler to dig through the ice and get his catch. With modern technology today, it’s good to be abreast. Check out our article listing the top fishing mobile apps to help you get a good catch. Traditional ice fishing methods are still being used today although modern anglers prefer the newer, more innovative methods as they guarantee bigger and better fish. 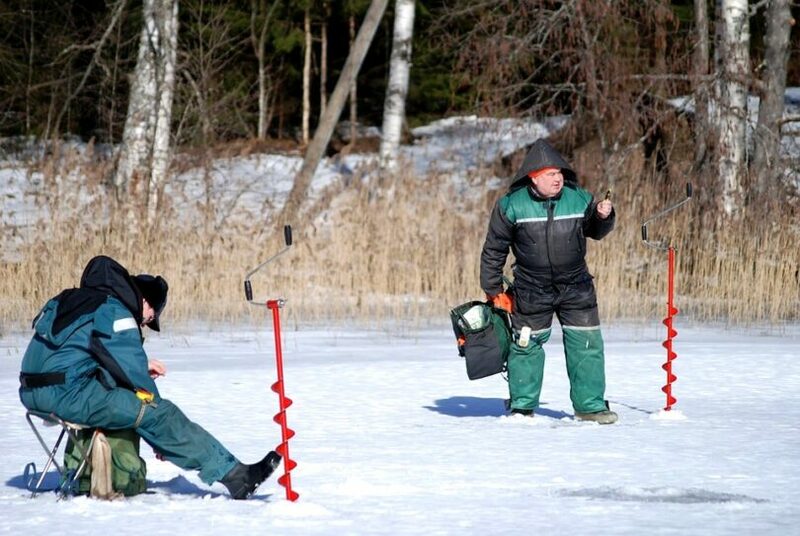 In addition to the traditional methods, modern day anglers also use a tip-up which is a less-intensive type of ice fishing. Tip-ups are usually made of wood or plastic and should be long enough to reach across the hole and be secured firmly. A line is then attached to the tip-up which is connected to a spool which is then connected to a flag. Bait is attached to a fishing line that is attached to the spool. The baited line is then placed under the ice. The flag will signal the angler if his line has a bite and once it does, the angler will then let the fish think that it is winning by pulling it at first and then letting go slowly then pull again. Once the head of the fish is out of the water, the angler is free to pull it out using a spear or another wood handled implement. Modern technology has also laid its hands on ice fishing with modern day anglers using it to increase the chances of them catching big game fish. 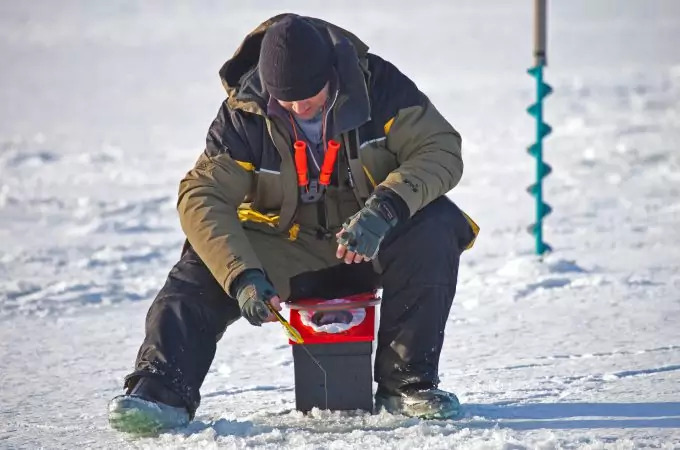 Most anglers use and auger to drill holes in the ice and then there are those who use global positioning satellites to locate schools of fish and better their catch. SONAR, in the form of flashers, is also used to pinpoint their exact location and let the angler know how deep the body of water is, and if there are other things present. Using flashers enable anglers to position their bait more effectively as they can move the bait directly in front of their prospective catch. Ice fishing is a dangerous sport with varying conditions affecting the outcome of the trip. It is recommended that the ice cover should be at least four inches thick before an angler heads out, some go out with just a little over two inches of ice present. 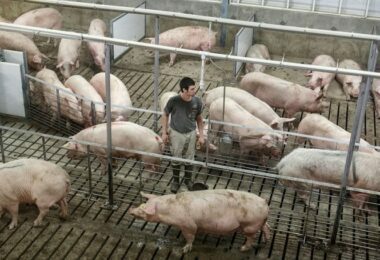 The prevailing weather plays a major part as well as some states regulate this kind of activity when there is a blizzard or a particularly strong snowstorm. 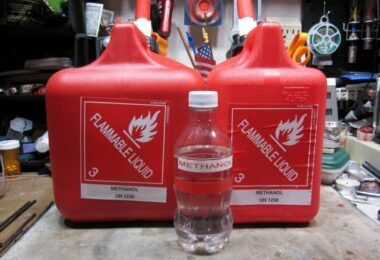 Other dangers may include misinformed anglers, vehicular traffic, frostbite and carbon monoxide poisoning. Now that you have some background information about ice fishing, it is time to discuss how to ice fish. Ice fishing as a concept may be simple enough but even old timers would say that the actual theory is far from the theory. 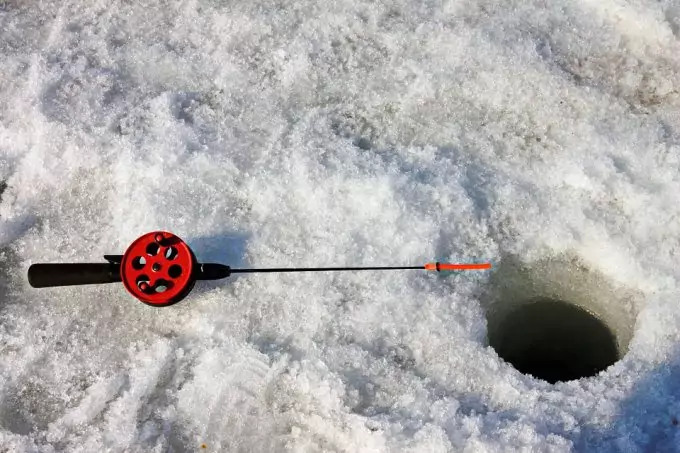 Knowing the proper technique and some additional tips would help make things easy for ice fishing beginners. The first step in learning how to ice fish is to get a license. States that allow ice fishing also have certain rules and regulations that they follow with regards to the practice of this sport. Having sufficient insurance also comes in handy when doing ice fishing as you never know what will happen. Auger – to help you dig the hole faster. Shovel or scoop – to remove any excess ice around the hole. Bucket – this would double as a bait bucket and your stool while waiting for your catch. Tie-up – ready-made tie-ups are usually sold in ice fishing specialty stores. Fishing line – the line has to be freeze-proof so the fibers of the line would not freeze-up while submerged in the water. This will also allow the line to be more flexible and easy to reel. Proper clothing – this cannot be stressed enough, make sure to have the proper clothing to address the weather conditions that you will be battling. Shelter – portable ice fishing shelters have sprung up in the market and these are usually tents specially made for the sport. Cabins and shanties are also available but they may or may not be where the fish is. Bait – ice fishing baits include winnows, wax worms and maggots. Logbook – this is more a journal than a logbook. For better success in the future, keep a log of the conditions that were present during each and every catch. Depth finder – this device helps determine the depth of the water beneath the ice. Flasher – this is the SONAR-like device used to determine “fishy” activities. GPS – helps you find your spot or spots. Camera – both underwater and weather proof. The underwater camera helps identify what kind of fish is available in the area. The weather proof camera helps you take pictures while you wait for your fish. The third, and possibly the most important, step is to know where you’re going. Once you have identified where the fish is, check out any local fishing news to know which fish is biting or if any incidents have happened during the past year. This will help you plan your trip accordingly. The fourth step is probably the easiest, find your spot. A good fishing spot is usually close to the bank and would have a good-sized ice thickness. The next step is to dig your hole. You can use your auger to dig a starter hole in the ice and then slowly increase its size by drilling around the original hole until the hole is about six to eight inches in diameter. Make sure to keep the diameter of your hole within this size to prevent accidental fall-ins. The sixth step is to put in your fishing line/implement and wait for the fish to take your bait. Keep moving. Much like summer fishing, if fish is not biting in your first spot, feel free to move to another and another until you reel your first fish in. Portable ice fishing shelters have allowed better mobility for anglers. Baits should be placed about a meter or so below the ice to catch smaller fish. Baits should be placed a little lower at two to three meters below the ice to catch game fish. Baits should be placed a meter above the bottom of the lake, river or pond to catch more elusive fish. Baits can be placed according to one or more of the theories but it is also important to do research on the depth preference of the fish you want to catch. Be one with the force. The force of the lure or flag that is. Always be mindful of sudden movements as they would indicate if you have a bite or not. The line itself can be an indication when sudden movements appear near or around the area where it enters the water. Take it easy. Like most animals, fish tend to feel lazy during the winter season and will move a little slower than they would during summer. Make sure to pull in your line slow and steady until you are sure that the fish has taken the bait before reeling it all in. Deeper lines also means a longer stretch so do not expend your energy all at once. Get jiggy with it. If it has been a while before any sort of activity has affected your lines, try jigging your line up and down so the movement can attract any nearby fish. The jigging intensity is unstable, sometimes you jig so hard yet nothing bites and then there are times where you just jig once and the fish goes piling right up. Experiment with your jigging from time to time to get the best results. Cover your hole. Not just after you’re done fishing but some fish that are not accustomed to sudden light and will tend to swim deeper, and then there are those fish that are attracted to the plankton that lights up when light hits them. To achieve the best result, try to cover the hole you made with ice shavings or a blanket/fabric to darken the area around the hole. Stir it up. Often called chumming, this practice is used when fish just isn’t biting. For chumming, you create an artificial commotion near the hole by grinding up some of your bait to attract smaller fishes. Bigger fish that would otherwise not move will be attracted to the feeding frenzy and move towards the hole you created. Shake that bottom. Fish like perch like to stay and thrive near the bottom of a lake or river during the winter. Tossing your lures and bait strong enough to hit the bottom will stir up the mud, sand and silt and attract other fish from a distance. One thing that is constant about ice fishing is the ever changing conditions. Always, always come prepared for anything that might happen. Have your medicines and first kid handy and make sure to bring some extra clothes and place them in a separate bag if in case your main bag gets wet or gets thrown in the water for some reason. Make sure that you read our piece on how to get a fishing and hunting license to get you up and ready for your next adventure. Knowing the basics about ice fishing, knowing how to ice fish and packing in some ice fishing tips serves as any anglers’ arsenal in any successful ice fishing trips. But all these knowledge will become irrelevant if we don’t follow certain etiquette specific to ice fishing. Others need space. Respect other anglers you meet out there. They also need their spots and the space to move as well. Never, ever drill too close to another ice angler. Lines can become tangled and fishing tactics employed by the other might disturb those that want to bite your line. Name your hole. Some anglers use customized flags to mark the holes that they made, especially the good ones as this would help other anglers locate their own spot. If a customized flag is not available, you can always opt to put a branch or a pile of rocks next to your hole. Let it go. Some states have rules that regulate the number of fish that one can catch through ice fishing. If fish is aplenty in your spot, let the smaller ones go so they can be bigger ones for you or others to catch. Observe silence. Excessive noise levels can also affect your chances of getting a bite so be respectful to others and keep your noise levels down too. Clean as you go. Once you’re done ice fishing, make sure that the area is trash free and can be used by another fisher. Fish guts should be stored away in a cool, inaccessible place for future use as bait or you can bury it deep in the ice so wild animals would not be able to get it. Ice fishing ‘s popularity is ever increasing due to its extreme and relaxing nature and before you go into this or any other sport, always arm yourself with the correct and proper knowledge to ensure success in any endeavor. Ensure that you have the right gear. Check out our review of the top ice fishing boots to help you with more options.